Dee Blackburn, Head of Retail Banking, and Eric Willman, Financial Center Administration Officer, were pleased to present the Paul M. and Lucy J. Gillmor Charitable Foundation with a $3,580.00 check on behalf of The Old Fort Banking Company. Old Fort Banking Company associates participated in and conducted several fund raising events, throughout 2012, in order to raise funds for the Foundation. P.M. and Lucy Gillmor led and inspired the local communities with their philanthropy. Today, their legacy continues through the efforts of the Foundation. The Paul M. and Lucy J. Gillmor Charitable Foundation works in partnership with local non-profit organizations, funding agencies, businesses, volunteers, and donors to invest in creative solutions that make a meaningful impact in people's lives. Dianne Gillmor-Krumsee, daughter of P.M. and Lucy Gillmor, carries on the Gillmor family values and philanthropic leadership as she serves as Board Chairman of The Old Fort Banking Company as well as a trustee of the Foundation. "I truly appreciate the efforts of everyone who played a role in helping to expand the ability of the Paul M. and Lucy J. Gillmor Charitable Foundation to meet the needs of people in our local communities," stated Krumsee. 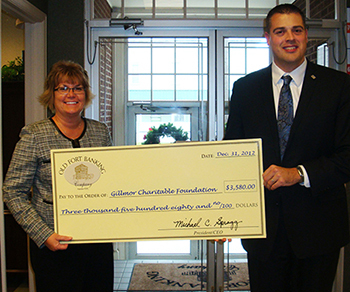 "The Foundation trustees would like to express their sincere gratitude to the Old Fort Banking Company associates for their continued support and assistance in making a meaningful impact to those in need," stated Michael C. Spragg, President and CEO of the Old Fort Banking Company and Chairman of the Paul M. and Lucy J. Gillmor Charitable Foundation.